Virgin Islands NightClub / Vessel Fire | Fire / Reconstruction Consultants, Inc.
A Nail Tells the Tale. It wasn’t a Needle in the Haystack, but the same intensive search was required to find that it was a Nail, that caused electrical wiring to fail. 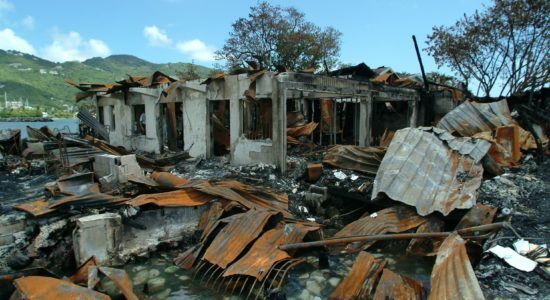 Fire Reconstruction Consultants, Inc., was assigned in order to conduct an investigation to determine the origin and cause of the fire that damaged the captioned structure and vessel (not shown). 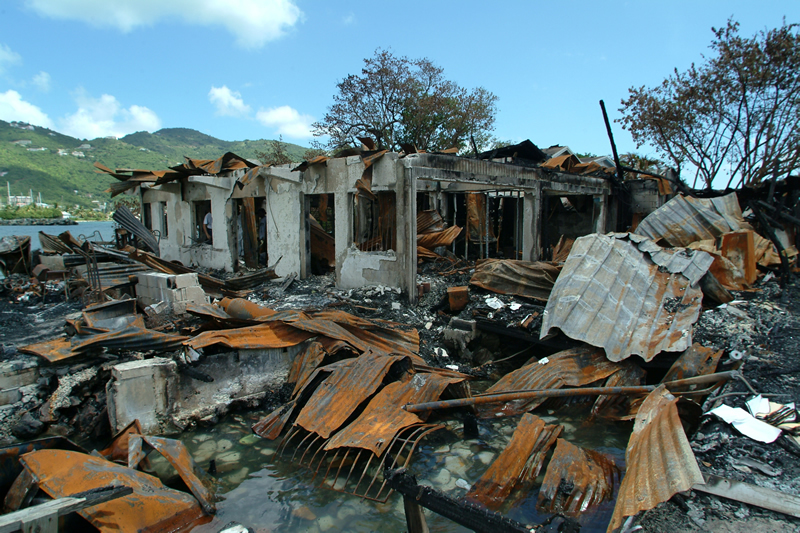 Present during the investigation were Virgin Islands Police, Fire & Rescue and Fire Reconstruction Consultants personnel. The investigation was conducted in accordance with standards set forth in NFPA 921, 2001 edition. More advanced engineering techniques were used in the evaluation and analysis of the data gathered on the fire scene. The structure that was examined was a two (2) story, restaurant, nightclub, office and marina storage complex constructed of a poured concrete and wood frame lower story and a wood frame upper story with steel over the wood frame roof. Analysis of the fire patterns, combined with observations of the several systems and areas of the structure had revealed that the fire initiated in the outer wall between the enclosed portion of the nightclub bar and an open deck on the west side of the bar area. One of the 1st firefighters on the scene indicated that this is the area where they first saw flames in the structure. 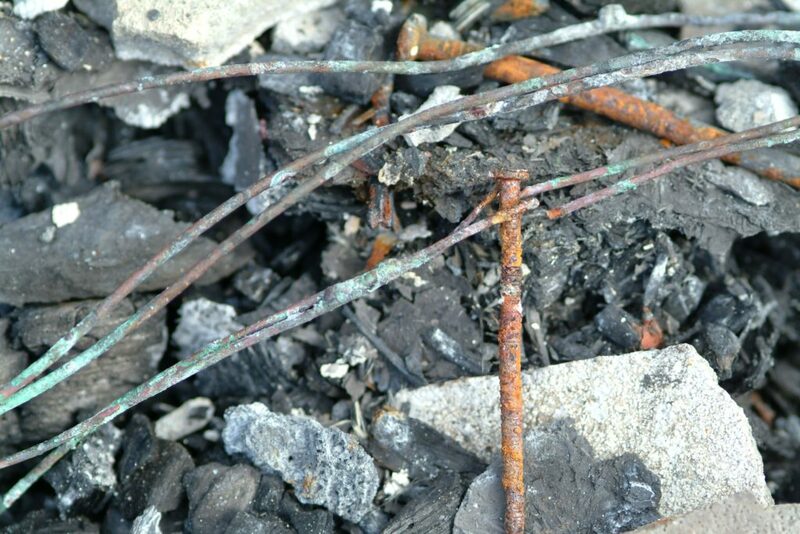 The result of Metallurgical testing had revealed evidence of copper adhering to two opposite sides of the steel nail indicating arcing between the two electrical conductors and the nail. One of the conductors had an indentation that exactly fit the nails contour. Other common fire causes such as discarded smoking materials, lighting, and spontaneous ignition had been eliminated. It was the opinion of this organization that the fire was in all probability accidental in nature. 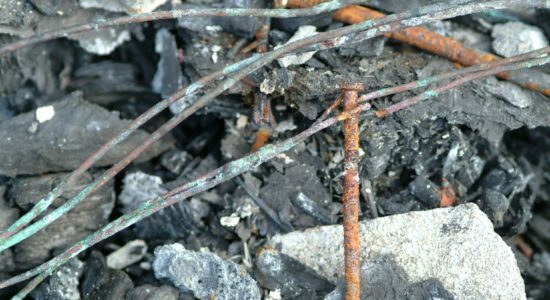 The result of a nail being driven through an electrical conductor and over a period of time the insulation deteriorated causing an electrical fault between the copper conductors and the nail, initiating the fire sequence and thus damaged the building structure and sailing vessel.